Media Ventures where studios and composers meet all under one roof! Media Ventures features state-of-the-art surround mix facilities, a spacious tracking room, overdub booths and one of the most illustrious film music mix resumes in recent history. Located in Santa Monica, within a mile of the ocean and in the heart of the West Side film production community, Media Ventures offers a full range of music production and audio post production services. Media Ventures is well known for technical excellence and adopting and applying the latest advances in digital audio technology. Studio A features an analog Euphonix CS3000 digitally automated console with ES108 Dynamics and a Cube (provides 32 additional busses and aux sends), three Pro Tools Mix Plus systems with Apogee and Euphonix A/D and D/A converters, and surround monitoring. 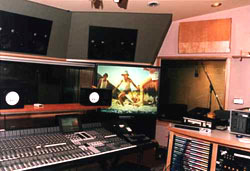 Studio A's surround mixes have a history of translating well on dub stages. 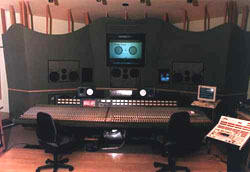 Studio B houses a Euphonix CS2000 console and one Pro Tools System. The mic cabinet is stocked with modern to vintage mic's including vintage C12's and an array of Neumanns. During the spring of 2002, Media Ventures was kept busy with the Dreamworks animated feature, "Spirit: Stallion of the Cimarron". Bryan Adams spent well over two months in Studio B recording the lead vocals for both the film and soundtrack songs for "Spirit", while Hans Zimmer's score was mixed by Alan Meyerson in Studio A. Some of MV's other recent mix projects include "Black Hawk Down", "I Am Sam", "Phone Booth", "Spy Kids II", "Spy Game", "Riding In Cars with Boys" "Invincible", "Pearl Harbor", "Shrek", and "Hannibal". Milestones for MV include the recording and mixing of the scores for the Academy Award-winning films "The Lion King" and "Gladiator". Many world class musicians such as Lisa Gerrard, Bryan Adams, Alex Acuna, Emil Richards, Heitor Pereira, Michael Fisher, and Lebo Morake have recorded at MV. Record and music projects have included Janes Addiction, Reel Big Fish, Goldfinger, Joe Strummer and the Mescaleros, Incubus, and Maceo Parker. Actors such as Michelle Pfeiffer, Tom Cruise, Kevin Kline, Kenneth Brannagh, and Val Kilmer have recorded voice-overs and vocals at MV. According to manager Tom Broderick, "due to the efficient, yet laid-back atmosphere, Tom Cruise and Sean Penn both cite MV as their favorite studio." Digital video is included in both studios as access to a high capacity Fibre Channel Storage Area Network (SAN), which enables both rooms to access the same audio files at the same time. MV currently has a T1 connection and several ISDN lines. This makes it easy to record a vocal in New York or monitor an orchestral session in London. The Live Room is accessible from either Control Room A or B, is approximately 22" x 30" and features a skylight, high ceilings and a C. Bechstein grand piano. Recording sessions have varied from recorded a small ensemble (17 pieces - strings, winds, upright bass and grand piano) for "As Good As It Gets" to group vocal sessions (12-16 vocalists) for "The Prince of Egypt". 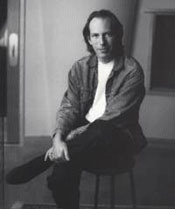 Noted Hollywood film composer, Hans Zimmer got his start as a member of The Buggles before making the shift into writing music for feature films. He was one of the pioneers of melding lush orchestration with modern electronic sounds to create a unique hybrid of the two. He has scored a wide range of films including Rain Man, The Lion King, and numerous Ridley Scott features and he has earned numerous Academy Award nominations. With a long history of participating on high profile films projects, Media Ventures experienced studio staff has fine-tuned the art of anticipating the diverse needs of the demanding film post production process. MV is renown for meeting impossible deadlines while staying organized and maintaining the highest sonic standards. Media Ventures services extend far beyond typical 'recording studio' services. In addition to recording and mixing services, MV can provide pre-dubbing and temp dubbing services, ftp transfers, ISDN sessions, coordination services, playback screenings for producers and directors, and dubbing services. Members of the MV engineering staff are experienced in operating Pro Tools at scoring stages and printing synths in preparation for a mix in a film composer's MIDI Studio. All staff members are highly proficient in digital audio technology. They are adept at pitching vocals, editing, encoding digital video, synchronizing digital devices, sorting out clocking, frame rate and pull up/down issues, creating click tracks, conducting audio transfers in any format, organizing and backing up data. Media Ventures Studios are a division of the Media Ventures Entertainment Group, the vision of a twenty-five year partnership between Academy-Award winning composer Hans Zimmer and Grammy Award-winning producer Jay Rifkin. Zimmer and Rifkin formed Media Ventures in 1989, after Zimmer had finished his first Hollywood score, for "Rain Man". The idea was simple: "To create an environment that included not only Hans Zimmer's MIDI Studio but also a world class tracking and surround mixing studio to create a synergy between the film composer and the mix studio," says Rifkin. 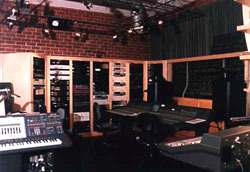 In 1994, Media Ventures expanded by renovating over 6,000 square feet of industrial space in Santa Monica to accommodate a larger recording studio and additional composing suites. Zimmer and Rifkin have fostered - at least in the Hollywood music production scene - a cooperative workplace atmosphere that cannily melds the traditions of the old studio system, the Silicon Valley bottom-up teamwork concept and the European mode of painters "schools", in which artists from Michelangelo to Rodin formed groups of protégés around them. Currently, the Media Ventures Entertainment Group boasts a studio campus spanning over 40,000 square feet. Here you'll find multi-media entertainment's spectrum of services with several divisions covering everything from scoring, studio services, music editorial services and music publishing to Web design and online marketing development, and even film and television production.